Increases Gas Mileage; Improves Engine Perf. Your stock fan robs your Mustang's engine of more than 15 horsepower! 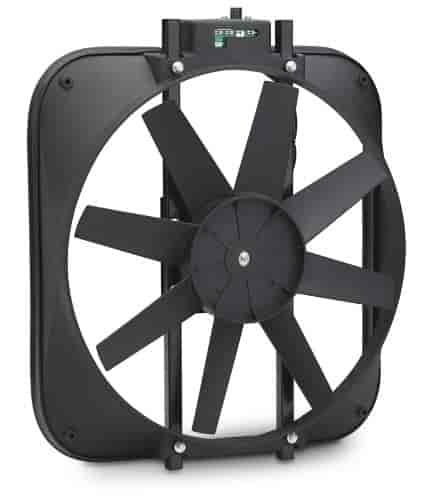 Replace it with a rugged, direct-fit fan from Proform. This fan assembly is equipped with an adjustable 180°-240°F thermostat. It bolts directly to your radiator supports using sturdy brackets. With a heavy-duty motor, aggressively angled blade and 15'' diameter, this unit pulls up to 2800 cfm of air. Overall dimensions are 18'' x 16-1/8'' x 4''. Note: Fits 1979-1993 Fox-Chassis cars only. 67015 is rated 5.0 out of 5 by 1. Rated 5 out of 5 by J Mey from Exact same fan as my high dollar name-brand fan I wish I had known about this fan 12 yrs ago when I bought my name-brand electric fan for THREE TIMES the cost, and it's the exact same fan! And even though it says it's for a Ford, it bolted right up to my Toyota with zero modifications. Like I said, EXACT same fan, just $200 CHEAPER! Would definitely buy again.